Marketing Information: Comtrend's new 8-Port PoE+ Lite-Smart Fast Ethernet Switch, the ES-7246PoE, features a unique power budget display feature. This feature allows VARS/installers to better troubleshoot and plan ahead when installing PoE-based solutions. 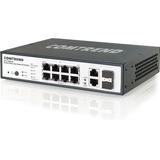 Standard PoE+ switches allow you to pass data and power simultaneously to a PoE enabled device. 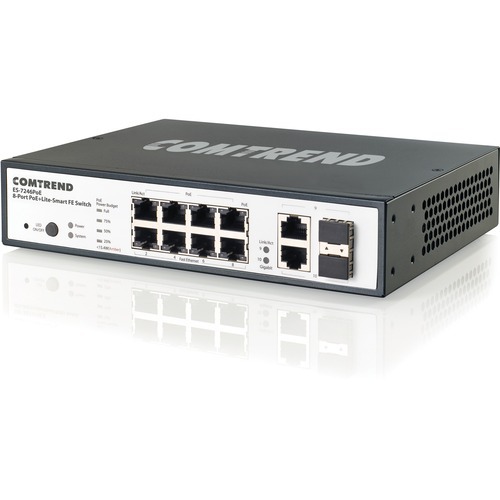 Additionally, Comtrend's 8-Port PoE+ Lite-Smart Fast Ethernet Switches allow you to see how much power is being used by the sum of all attached PoE devices relative to the total amount available. This enables better troubleshooting with immediate visual feedback. For example, if a PoE camera is installed, but not working, the VAR/installer can rule out exceeding the power available, otherwise known as being "over budget." This unique power budget display allows on-the-fly changes of equipment without consulting each device's power specifications. This functionality reduces installation time and related expense. Suitable for high-powered devices, the 8-Port PoE+ Lite-Smart Fast Ethernet Switch supplies up to 30 watts of power per port, one of the highest in the market today, as well as supporting IEEE 802.3af & 802.3at standards.